Maybe a little simple for readers of this forum but I made this video for completeness sake if someone is starting to work on their car for the first time. The first step in removing a wheel is to loosen the wheel nuts. Take a breaker bar and the correct socket size then turn anti-clockwise. If the wheel is stuck to the hub then you can give it a gentle kick to loosen it. Inspect the wheel for problems such as excessive wear, cracking and objects like nails that could be stuck in there. Rubber perishes over time so most manufacturers recommend changing your tyres if they are over 10 years old. To check thread depth insert the checker as show and make a note of the reading. You can do this with the wheel on the car but it’s easier to do when it’s off. The thread on a tyre helps move water away from the tyre when the road is wet. Most tyres start with 8 millimetres of thread depth on them. As I record this the legal limit in the UK is 1.6 mil and you will fail a MOT if it’s less. The general recommendation is to consider replacing tyres when the thread depth is down to 3 millimetres as below that tyre performance in the wet becomes much worse. Put some anti-seize paste on the wheel hub to prevent the wheel sticking to it in the future. Put the wheel back on and hand tighten the bolts. Always tighten in a star motion. Lower the car then, using a torque wrench tighten the bolts to the correct torque – your handbook or manual will tell you. For my Boxster it’s 130 Newton metres. Now we will check the tyre pressure. 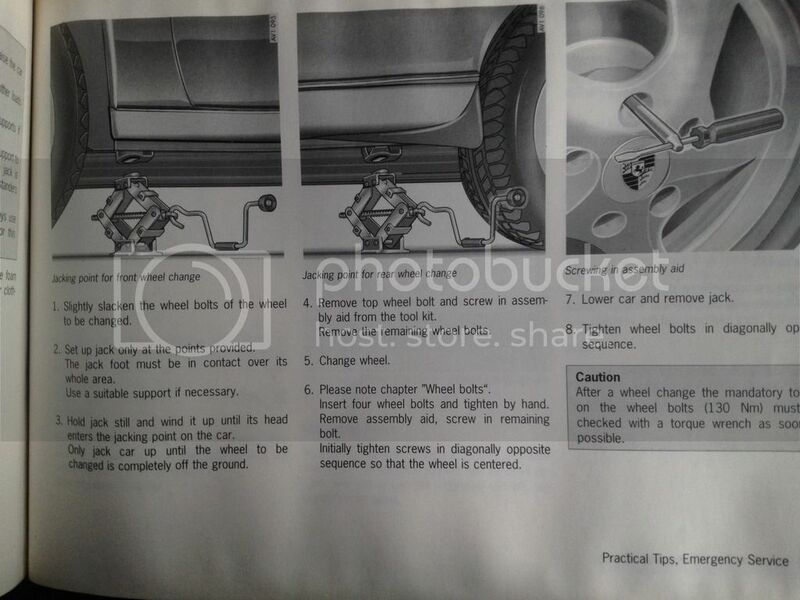 To find out what pressure is correct for your wheels look in your handbook or on the car itself. On a Ford Fiesta the pressures are located near the door and on my Boxster they are under the bonnet. If you just want to quickly check the pressure use a gauge. Just remove the dust cap on and press the end of the gauge onto the tyre valve. Over or under inflated tyres will result in less grip and uneven wear. 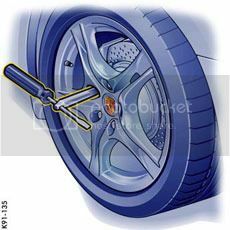 To inflate the wheel unpack a compressor and connect to the car’s power socket. . Use the buttons to set the desired pressure and then connect the other end to the tyre valve. Press the Start button to start the device. It will stop automatically when the desired pressure is reached. Once done remove the compressor and put the dust cap back on. Any suggestions for future videos are always welcome. I didn't see any mention of the lug bolt alignment tool. You really shouldn't change your wheel without using the lug alignment tool or you may end up with damaged calipers. The local Firestone just did this to my car and I had to repaint two out of four calipers. Last edited by JayG; 03-21-2016 at 06:53 PM. Thanks for the tip. Tell me more about this alignment tool. Is it supposed to come in the tool kit or do you have to buy it separately? Last edited by JayG; 03-15-2016 at 02:50 PM. Porsche calls it the "wheel assembly aid". It should be in your toolkit. Bullocks was a department store in So Cal. Indeed, the owners manual is for reading! I've never understood why Porsche insists on hiding critical information in the owners manual. How do they expect anyone to ever see it? Ahhh, more good old fashioned Winnipeg sarcasm. Gotta love it!